Vintage Warbird Jet Cockpit Warning Indicator Light. Manufactured by Dialco. P/N unknown. Common warning light found on several early warbird jets. Very clean item. It would make an excellent show item of the office or home or as a mock up panel light. 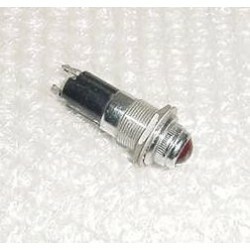 Vintage Warbird Jet Cockpit Warning Indicator Light. Manufactured by Dialco. P/N unknown. Common warning light found on several early warbird jets. Very clean item. It would make an excellent show item of the office or home or as a mock up panel light. 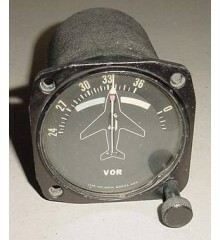 ..
3 1/8" Vintage Warbird Jet Homing Indicator. Manufactured by Dorne & Margolin. Type DM-ED3-5/B. Very clean item. It shows very well and it would make an excellent show piece for the bookshelf in the office or home or just as a mock up panel item. 3 1/8" Vintage Warbird Jet Homing Indicator. Manufactured by Dorne & Margolin. Type DM-ED3-5/B. Very clean item. It shows very well and it would make an excellent show piece for the bookshelf in the office or home or just as a mock up panel item. Do you happen to know the type ..